Shocking news heat the air waves like a thunderous lightening, Friday afternoon when the National Station announced at 1pm,that Dr Nalova Lyonga, now former Deputy Vice chancellor in charge of Teaching,professionalization ,Information and communication technology in the University of Buea has replaced Professor Vincent PK Titanji as Vice Chancellor.This news first came as rumor among students and Lecturers, then to reality when the English version of the News was broadcaste at 3pm.To many it was just like a normal decree, but this one was special because had been expected long ago and it affects UB. Indeed it is the truth, a lady is at the helm, she is now in charge!!! This recent appointment from a presidential decree Friday June 29,2012 has come at a time when many had predicted Titanji’s departure, who is now on retirement. Dr Nalova Lyonga, author of African Books Collective (Socrates in Cameroon) is the second female as well as indigent of the South West Region at the mantle of command in the Place To Be, after Njeuma.Titanji was named Vice Chancellor on December 14,2012,six years after he is succeeded by another Iron lady. The new Vice Chancellor of the University of Buea, will have as great task to curb down the numerous strike action,problem of transcripts,poor water facilities,little or no street light and many others.Dr Nalova Lyonga passed all stages of the corporate ladder at the University of Buea. Specialist in literature in English, she was vice president before her new promotion. According to the presidential decree,the former Dean of the Faculty of Medicine in the University of Yaounde 1 , Maurice Aurelien Sosso, also former Inspector General of services to the Ministry of Higher Education,now called up as new Rector at Yaounde One. The new rector of the University of Douala is a political scientist, a teacher at IRIC, Dieudonné Oyono, specialist in the history of international relations was the coordinator of the National Governance Programme before his new post. The presidential also text devotes a presidential mutation. The physicist Oumarou Bouba, a native of Benue, left the University of Yaounde 1 to that of 2. 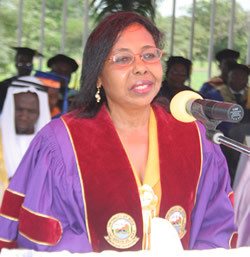 Nalova Lyonga is the first woman promoted to head a public University since Dorothy Njeuma left. Since the departure of the latter, a native of South West or Fako, had not led the first Anglo-Saxon University of the countrtry. 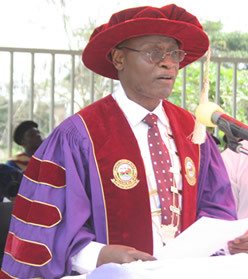 Head of IRIC, Dieudonné Oyono, inherits the largest University in the economic capital. Aurelien Maurice Sosso, son of Nkam, is the first Sawa who will lead the University of Yaounde 1 since its inception in 1993. leaders of State Universities of Dschang, Bamenda, Maroua and Ngaoundere have not been changed. This is great news beacuse: the old order must change yielding place to the new else, one old good custom will corrupy the world.